The content of this article provides interesting history, facts and information about the Ancient Roman Religion and Ceremonies. The religion of the Romans was a polytheistic religion, a religion with many gods (Polytheism). The religion of the Ancient Romans included elements of primitive beliefs including magic in the form of various charms and ceremonies. The Ancient Roman Religion and Ceremonies included the worship of natural objects, the worship of trees and to some small extent the worship of animals. The Ancient Roman Religion and Ceremonies also included the worship of the household, the worship of the fields and the worship of the state. Click one of the following links for facts and information providing an overview of the Roman religion, Roman priests and the ancient Roman Gods & Goddesses. The fundamental basis of the Ancient Roman Religion and many of the ceremonies was based on the belief that if the Gods and Goddesses were happy then Rome and the Romans would receive good fortune. Sacrificial offerings were therefore made to the ancient Roman gods. The types of sacrifices were very specific and highly ritualised. The Ancient Roman Religion and Ceremonies encompassed the primitive beliefs in magic which asserted human ability to control the natural world including events, objects, people and physical phenomena through mystical, paranormal or supernatural means. Ancient Roman religion used charms, spells, chanting, sacrifices and various ceremonies in order to control the natural world such as ceremonies to produce rain. Religious festivals such as Saturnalia and Bacchanalia were celebrated where sacrifices, ribald songs, lewd acts and sexual promiscuity were also practised. The ceremony of the aquaelicium was designed to produce rain after a long drought. In ancient times the ceremony consisted in a procession, headed by the Pontifices, which bore the sacred rain-stone (lapis manalis) from its resting-place by the Porta Capena up to the Capitol where offerings were made to the sky god Jupiter together with a symbolic ritual of pouring water over the stone. A similar rain charm and ceremony was practised in the curious ritual of the Argeorum Sacra which involved throwing puppets of straw into the River Tiber as a symbolic wetting of the crops. The success of the harvest and crops were necessary for the survival of the Ancient Romans. Crop ceremonies included the ceremony of the Augurium Canarium during which a red dog was sacrificed for the prosperity of the crop. There was also a symbolic killing of the red mildew (robigo) and a ceremony practised in April involving the slaughter of pregnant cows at the Fordicidia which also related to the fertility of the earth. The Ancient Roman Religion and Ceremonies also incorporated the worship of trees and the spirits which were believed to inhabit the trees. The sacred oak of Jupiter on the Capitol, was hung with the 'spolia opima' following the Triumph of a Roman general. 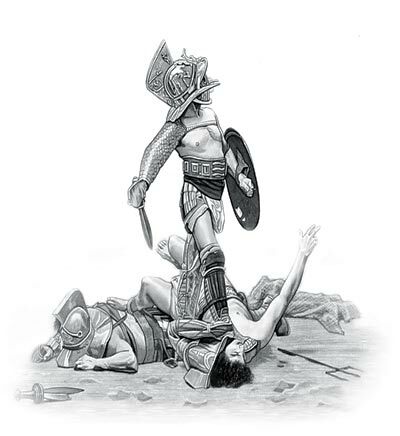 The dedication of the 'spolia opima' to the spirit of the tree demonstrated great honor and respect as the 'spolia opima' (or rich spoils / trophies) refers to the armor, arms and other effects that an ancient Roman general had stripped from the body of an opposing commander who had been slain in single, hand-to-hand combat. It was not only special trees which were regarded as the home of an Ancient Roman god or goddess. The tree in general was sacred and it was believed that any tree might possibly be inhabited by a spirit. "Be thou god or goddess, to whom this grove is sacred, be it granted to us to make propitiatory sacrifice to thee with a pig for the clearing of this sacred spot." "Do thou, Diespiter [Diespiter was another name given to the god Jupiter], strike the Roman people as I strike this pig here to-day, and strike them the more, as thou art greater and stronger." The Ancient Roman Religion and Ceremonies incorporated the worship of the household appears to have originated from the sense of the sacredness of certain objects closely bound up with the family life such as the door which was the protection against the external world by which the household went out to work in the morning and returned at evening. The hearth, the giver of warmth and nourishment and the store-cupboard, in which the food for the household was preserved for future use. This included the worship of the Roman gods Janus, Vesta and the Penates and Lares who were the gods who were supposed to attend to the welfare and prosperity of the Roman family. Little statuettes of the Lares and Penates would be fetched from the shrine (lararium) and placed upon the table in token of their presence at the meal. The Ancient Roman Religion and Ceremonies importantly incorporated the worship of the state. The Romans merged state and religion in a belief system. The religion of the Roman state had its own gods which were the products of diverse cultures and ancient beliefs. In the state organisation of the Roman religion a legal conception of the relation of god to man emerged. When a Roman made a sacrifice or gave an oath to a god it was a legally binding agreement. The content of this Ancient Roman Religion and Ceremonies category on life in Ancient Rome provides free educational details, facts and information for reference and research for schools, colleges and homework. Refer to the Colosseum Sitemap for a comprehensive search on interesting different categories containing the history, facts and information about Ancient Rome.